Plus: Dilraj Mann’s cover for ‘Island’ #15 examined, Mike Richardson, Gilbert Hernandez, ‘The Mundane Kid’ and more. 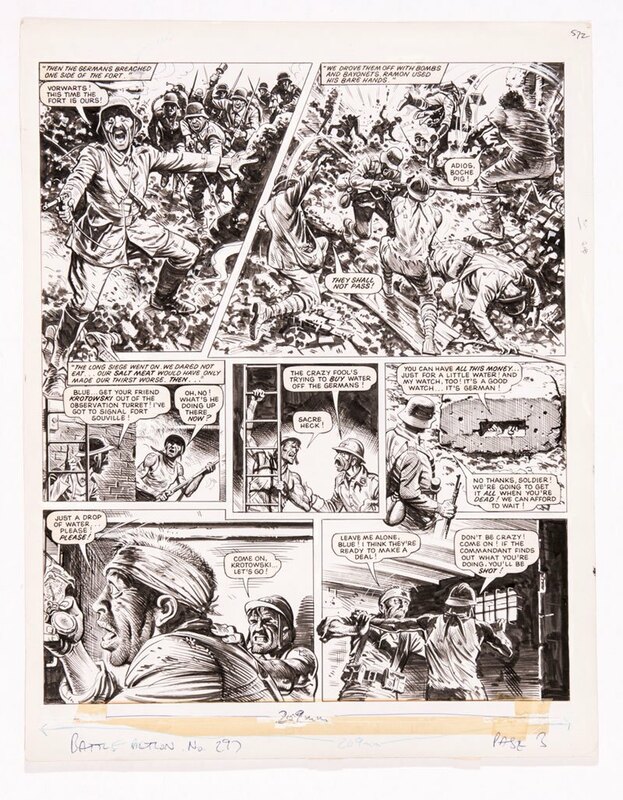 Auction Action: A piece of original art by Joe Colquhoun from the British comic Charley’s War fetched an unexpected price of £1,320 at auction, soaring past the pre-sale estimate of £250-300. A lot of three consecutive pages, plus a cover layout, went for £2,450, triple the pre-sale estimate. Some other original art as well as vintage comics also did better than expected at the Compalcomics auction. Charley’s War, a World War I action comic written by Pat Mills, is enjoying something of a revival; Titan is publishing a collected edition, and some of the original art is currently on display at the Tank Museum in Bovington, UK. Ting, as he was known by fellow Free Press employees and also readers, was loved for his enthusiasm for local subjects and gentle sense of humour. Many a fan noted how his cartoons touching on subjects like London transit, city hall politics and Forest City personalities could run in the newspaper today. Simply put, his work was timeless. Local Hero: The Lusaka, Zambia, paper interviews comics writer Benny Blow (Bwanga Kapumpa), co-creator, with artist London Kamwendo, of the webcomic The Mundane Kid. I Wasn’t the Only One: Bill Kartalopoulos also had an interview with the late Benny and Penny creator Geoffrey Hayes languishing in his archives; Bill did production work on the first few seasons of TOON Books in 2007-8, and during that time he interviewed Hayes for a promotional piece on the TOON website. That interview was heavily edited, though, and this week he posted the unedited version at The Comics Journal. Love and Podcasts: The CBLDF crew interview Gilbert Hernandez on their podcast. Nice Place You’ve Got Here: The Portland Business Journal team pays a visit to Dark Horse CEO Mike Richardson and marvels at the collection of figures and toys in his office. There’s a slide show so you can see for yourself! 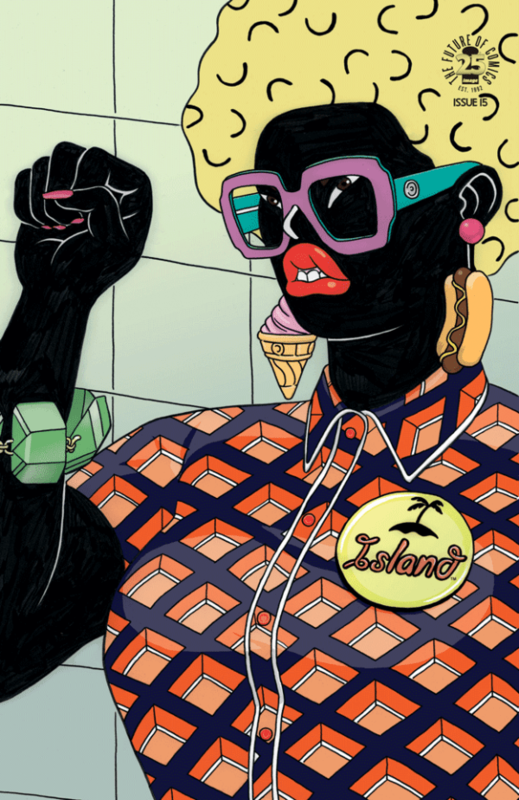 Comics With Issues: Julian Lytle convenes a panel of smart commentators for a roundtable on Dilraj Mann’s cover for Island #15, as well as a broader discussion of editorial practices and the situation of black women in comics right now, at the Ignorant Bliss podcast. The contributors include J.A. Micheline, Darryl Ayo, Cheryl Lynn Eaton, and Ronald Wimberley, so it’s well worth a listen, but set aside some time as it’s almost two hours long. Job Posting: The City of Seattle is looking for a Northwest-based artist to create a graphic novel about the Georgetown Steam Plant, once a state-of-the-art power plant and now a historical site. Family Con: Northwestern Arkansas is getting its own comic con, the Arkansas Art Pop Expo, this weekend; the organizers, Jon and Jackie Woodard, attend a lot of cons themselves and often have a booth selling Jon’s art. Still, they didn’t get into the con habit until they went to a Wizard World con a few years after they were married—and Jon got a big surprise: ““When we got to the show, it didn’t take long to figure out she was a bigger fan than me,” he said. Arkansas Art Pop will feature cosplay (but no real weapons, please), panels, and vendors, and guests include comics artist Tom Nguyen, make-up artist and Face Off contestant Keaghlan Ashley, and actor Vernon Wells.